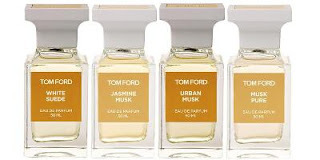 Still fascinated by the depth and imagination of Patrick’s Suskind’s 1985 novel ‘Perfume’ (set in 18th Century France), I don’t know why, but I rather imagined Tom Ford’s collection of musks to be a lot more true, heavy and gritty than they actually are. Gone in my imagination is the leathery sweat of days gone by musk, visceral and brewing masked with expensive oris, jasmine, sandalwood and patchouli. However, this is to their advantage. Having trial tested White Patchoulli and Black Orchid from the Ford stable of Private Blend fragrances, I was both trepidatious and entranced to try the four musks released at the end of 2009 (Urban Musk, White Suede,Musk Pure and Jasmine Musk) are sheer versions, powdered and puffed up for a 21st Century cosmopole. Who am I to tell Mr Ford re marketing but I would have thought these best kept for a Summer launch (thus the reason for the review) as they are less intense and heady than the other private blend fragrances and perfectly fit a late Spring/Summer mood. Tom Ford’s polish and undoubtable aplomb shines through as these white fragrances evoke a mix of 1970’s ‘Charlie’ perfume girl, professional business woman meets 2010’s global traveller via Metropolitan boutique hotels…iPhone and iPad at the ready. So, they should be perfectly in tune with Autumn/Winter ‘10’s new strictly beige, strictly boardroom fashion feel: feminine fragrances that work the room and still retain their independence. If you start wearing musk now, by then, you won’t want to change. These are clean, sheer musks for urban sophisticates. Jasmine musk emphasises the headily white floral rather than the musk. Like falling into a bell jar of intoxicating jasmine with a slight fruity, sugared tinge rather than an over floral drenched character, this is the stuff of sultry seductresses. A pure accord of ylang ylang and jasmine opens into a central warm patchouli blending with the rich florals. Then, there’s a stable background of vanilla, sandalwood and orris to keep you grounded and stop you flying high on white scent. There’s a lovely sweet roundedness to this sumptuous and rich choice. The musk is faint as the sweet honey and sweet yet spicy pepper sparks through. The jasmine sambac used is light and faintly exotic. 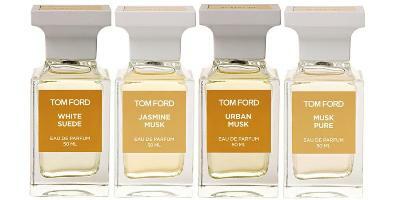 Urban musk is the choice for ‘toe in the water’ musk fans. Still resolutely feminine but more approachable. A warm soft young motherly scent without being matronly in the slightest with its creamy muskiness accentuated with the white honey addition. Urban musk could cocoon you – a soft, slight scented man trap of a fragrance. This one’s a chic grower and surprised me, so don’t discount after a brief spritz. Its amber sweetness develops and deepens throughout the day. Makes me think of boutique hotels, quality luggage, travel and possibilities. This one’s funny and is also, incidentally, my favourite. White Suede evokes a mood and a persona but I’d say it’s definitely more camel/beige beige than white suede. The softest palest calfskin springs to mind. Large camel suede sofas, unblemished deep pile carpets and heavy silk drapes with carefully chosen global antique artifacts for highlight….or am I just thinking of Tom Ford’s world? The fragrance is the most immediate and explores the duality between feminine and masculine with its blend of leather-suede and musk/rose. “That one please!” is the wearer’s first reaction with this popular fragrance which has the most staying power of all four musks. A rush of Bulgarian rose opens the fragrance mingled with the first hint of musk. This is then restrained by golden saffron and finally, the suede centre reveals itself in gentle smoky waves. A white powdery floral, promised heady scent dries down to a memorable frankincense centre like a classic beauty in vintage Balenciaga, entering a bar room environment. Like silken white suede on fingertips, be careful not to blemish. Both startlingly modern yet retaining a retro ‘50’s feel in the sandalwood, amber, lily of the valley mix; I can see this fragrance appealing to many ages and types. Musk pure begins with a stunning blend of sparkling aldehydes that create a surge of bright, white energy to pave the way for musk’s entrance. Italian citrus fruit and ylang ylang add to the chemistry and allure while the middle heart is constructed of sheer jasmine sambac. Redolent of a true vintage fragrance and a purist’s delight, this is one for the finely featured, fur clad woman or rather, the confident socialite. It’s rather grand and opulent and is more Hotel de Crillon and The Ritz (Paris) than The Soho Grand in NYC or Soho Hotel (London). Musk Pure is assured and has swagger. In the same vein as Patou’s Joy or Lanvin’s classic, Eau Arpege, Ford’s uniqueness is adding benzoin and beeswax to the musk mix. This one’s the most difficult to wear and I’d wager is sold to more women of a certain age or of a true confidence that escapes youth. That’s what makes it all the more sweet. Powdery confidence in a flacon. The right juxtaposition exactly for wearing with your finest vintage dress and Charlotte Olympia shoes. Tom Ford Private Blend White Musk Collection comprises Urban Musk, Jasmine Musk, White Suede & Musk Pure. They are each available in Private Blend EDP sprays (50ml) at £110 each. They are available at branches of Harvey Nichols and Selfridges and the Roja Dove Haute Parfumerie, Harrods. For stockist enquiries, please call 0870 034 2566.